Ok, hang on to your seats people, I know you've seen the Flapperdoodle ladies around but if by some crazy chance you haven't, let me give you a little background. A while ago, I had a guest feature on Design Lovely's Lovely Looks and at this time I mentioned my growing affinity for Flapperdoodle prints. Well, right after that feature, I received a little comment from the creator of these darling prints, Kate. Always having my reader's best interest in mind, I contacted her and after stumbling all over my words and proclaiming my love for her prints, Kate agreed to a special giveaway for Down and Out Chic readers. (You can thank me later). Kate is offering a special 11"x14" print (this size is not currently offered in her shop) for the winner's choice of illustration. 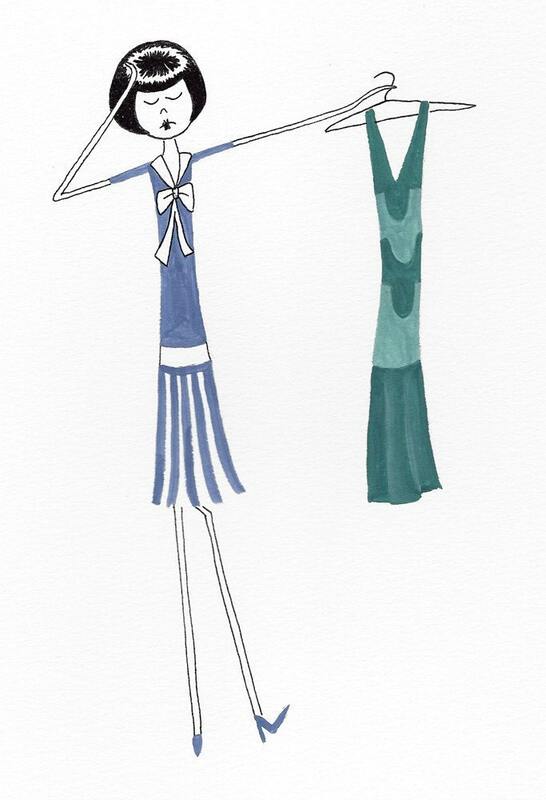 You get to choose ANY print out of the Flapperdoodle shop! When you see the selection, I don't know how you'll choose. Seriously. Here are a few pieces...there are so many more. 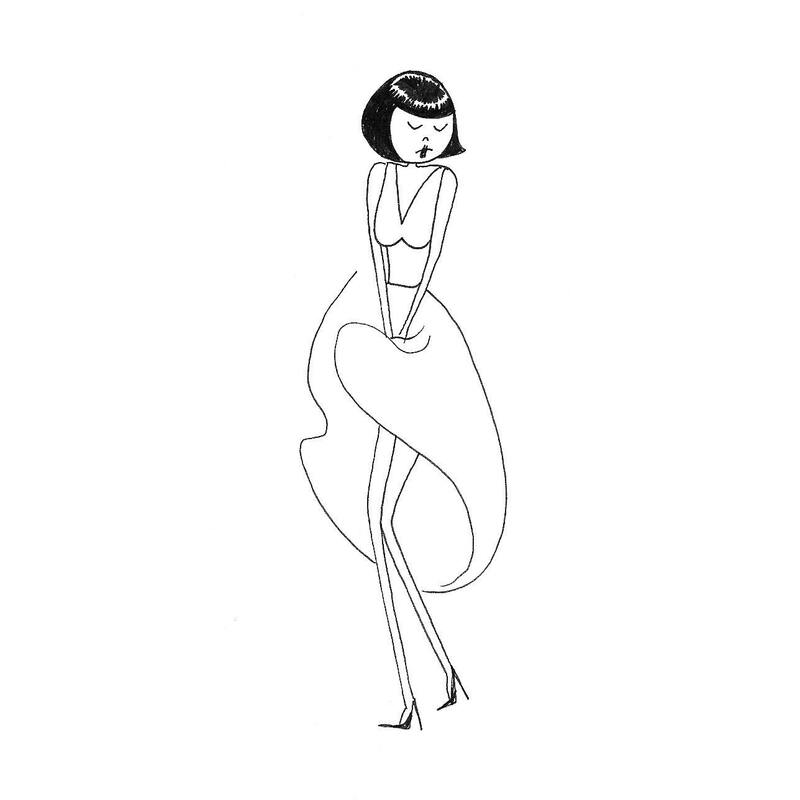 The Flapperdoodle characters are dramatic, feminine, cheeky, and silly. I want to be their friend. To learn more about the characters Eloise, Ramona, Emma, and Clarissa, please check out Kate's Flapperdoodle blog. So are you wondering how to enter? You can enter up to THREE times! 3) Post this giveaway to your blog, Facebook, or Twitter and leave another comment telling me so. (3rd entry). B and I are attending a wedding this weekend and then on Sunday we're going to Atlanta to see my brother and nephew for a few days! I'll be back to my normal routine next Wednesday but you should hear from me before then. I hope you have a wonderful weekend and good luck with the giveaway! O.M.G. ANOTHER amazing fabulous giveaway..you are sooooo good to us!! gahh no, I totally don't have a fav print. I just pick those girls are all so cute! I like Eloise, Ramona and Clarissa visit the beauty parlor, and the Flapper doodle stationery set,AND Ramona frets about what to wear this evening..and,and,and....its all just way to adorable...The vote one is just too fantastic as well! have a great time at the wedding and spending time with your family! I love the new audrey hepburn in sabrina one!!! and girl you know i'm a follower!!! I should not be entering because I WON before, but these are too cute not to try. So there! And I am going to try AGAIN! Because I love that little tutu print and I have (almost) that hairstyle. These are wonderful! My favorite is "Eloise goes for a ride on her Vespa". I'm Italian, I love Italy, and I love Vespa's! What charming drawings. Ah looooveee these! I want the Eloise, Ramona and Clarisse dance the Charleston - it makes me think of my sister, mother and I. Too fabulous! So cute! I love the VOTE print! Btw, the comment police have been out in full force today, I couldn't leave a comment here or on another blog earlier today. I had found an older post of yours I was trying to comment on, I'll have to see if I can find it now. How to pick just one?? These are FABULOUS! I think I like The Cat Takes Eloise for a Walk. Love it! LOVE these!!! I'm so grateful for the introduction. The ballerina one is my fav. So cute!! Thanks for commenting on House of Turquoise! I just started following your blog! I'm a lovely reader (well now I am that I found your blog - all thanks to flapperdoodle). awesome! i'm actually doing a giveaway for her in a couple weeks, too! i won't enter this but i love the giveaway! I love the one of her holding her dress down. so cute..i am a follower, and posted on twitter! Elois practices yoga is the cutest thing ever! Such adorable prints. I would love the Ramona and Eloise on a bike. Oh my, these are amazing!! Thanks for the great giveaway. I love Eloise time travels to 1963, but gets caught in the rain, as I always seem to get caught in the rain too! So cute...is that girl old enough to vote? I drool over her shop and blog all the time. I love, love, love Eloise at Audrey in the Givenchy dress. I want that one. oh and i'm a follower, duh. AND i'm pimping this out in my sidebar. wow! what a great giveaway! i love all of them but there's just something about Eloise and Ramona dance the Charleston ... its so fun!! For some reason I'm drawn to this one: Eloise time travels to 1963, but gets caught in the rain. & of course i am a follower! It is WAY to difficult to choose one favorite... they are all so amazingly cute! I would say the Paris one, the balloons, or the ballerinas! I think I like the Eloise and Ramona play hide and seek print the most - but it's so hard to choose as they are all adorable! ha ha :) amazing and funny sketches!! the girls are so cute and are also with attitude! I adore Ramona wears her new cloche! and I just voted for flappedoodle!! such lovely work it is! Did you ever see the Q&A I did with Kate? http://www.magchunk.com/2009/06/08/artist-kate-gabrielle/ I love her work. Off to tweet for entry #2! You are spoiling us with your giveaways!!! I love these... especially the Vespa!! It reminds me of my travels!! but they are all so cute! womp womp! I'm seriously so excited about this giveaway, I may just pass out. Love, love, love flapperdoodle!!! Hello I'm fairly new to your page, I am now a follower and I've just tweeted about this very neat contest. I think my favorite flapper doodle print is the one where the girls are attempting to hula hoop. I adore that one and Kate does such an amazing job! and how lucky~ a giveaway! Eloise and Ramona play badminton. I love the "Decisions Decisions" print... I could see it hanging near a vanity or in my dream closet. I also love the hoola hooping one. So fun! PS_Erinwin a flapperdoodle print here: http://tinyurl.com/mz96kq If I win, I think I'll choose the "decisions decisions" print. So flippin' cute! I love the one of the girls eating eating neapolitan ice cream! Super! cute cute cute!! love the style! ohmygosh, I'm so glad that you are showing me her...these are darling!! there are so many good ones! i love the one where they are dancing, the yoga one and the one where they are eating cotton candy. Those are so cute! I didn't get a chance to look at them all, but I love the ballerinas! I'm a follower, please enter me! Sweeties!! I'm a follower - Ramona wears her new Cloche hat - that's my pick!! Well, I've been a fan of Eloise and Ramona since Kate debuted them on Silents and Talkies. I guess it's for that reason that it's hard for me to pick a favourite. I would suppose if I had to, it would be Eloise on the Vespa (my faovurite era has always been Swinging London. I love 'The flappers go to the moon.' Such a unique and cute theme! This is a fab giveaway. I can't pick a favorite! oh i love them...they are so freaking cute!!!! i love may pole, swing set, dance the charleston and time travels. who am i kidding? i love them all! I'm not entering the comp, but I've never seen those prints before and OMG I love them! They're so adorably simple and quirky! Great giveaway! 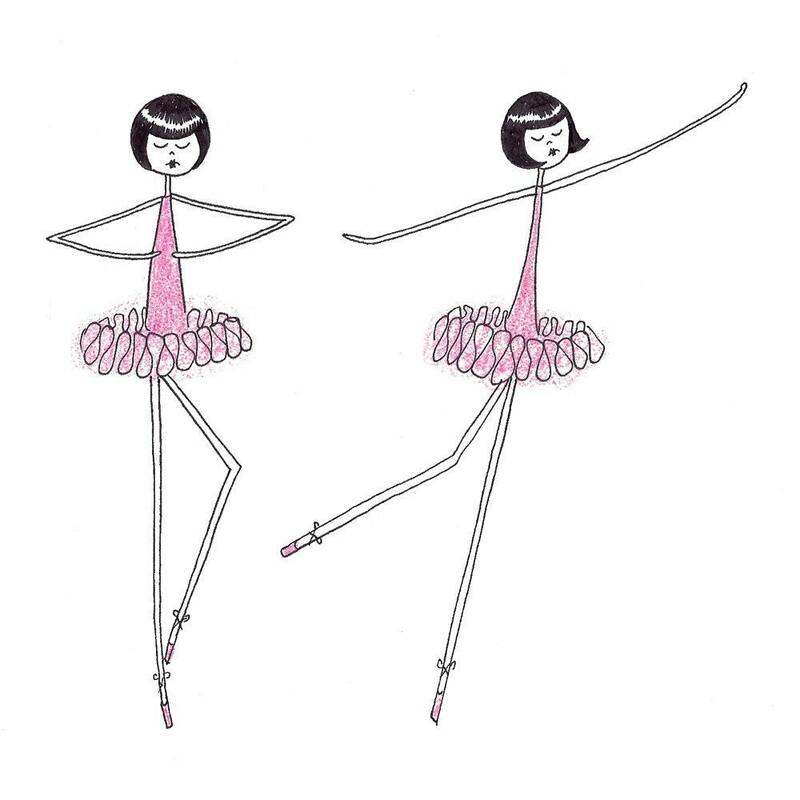 Her illustrations are lovely, they fit right in with my love of flappers... my favorite is 'Eloise, Ramona and Clarissa dance the Charleston'. Incredibly cute. What a wonderful giveaway ... I SO missed your blog my sweet christina ....I hope you had a greatime at the wedding !!!! 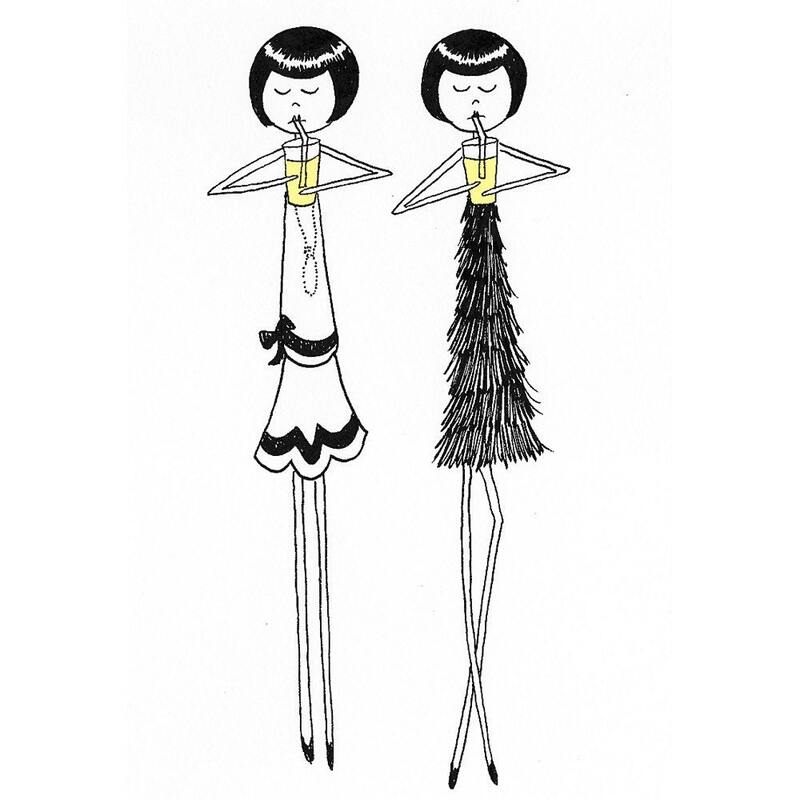 I love Flapperdoodle! So cute. Thanks for sharing. I love the Marilyn Monroe. Looks fantastic. I love the Life Is Like A Bowl one. Hope you had a nice weekend. I love Eloise and romona eating cotton candy and drinking lemonade. too cute! I'm a follower. Love this blog! I also just posted on facebook! My favorite is "Eloise and Ramona eating neapolitan ice cream" SO cute! Posted to my blog http://bonitas-cosas.blogspot.com/ AND my twitter account. I'm a follower and I LOVE the Eloise as Audrey Hepburn in Funny Face one- so cute!! So cute! I love "Unlike Eloise, Ramona has learned to hula hoop." These would be so cute to hang in a dressing room or bathroom. I like the rollerskating pic - cute! I love Eloise and Ramona go to Paris and the one as Audrey Hepburn with the Green and Blue baloons. Too Cute! I am a follower! Yay for 2 entries! oh wow, those are so cute, simple but gorgeous :) I really like the 'Eloise Jumps in a puddle' it looks so playful even with her 'flat' face, haha... and I love the colors (guess I'm a color maniac?) this is so fun! Thank you for hosting such a fun giveaway! My fave has to be the one you also chose: "Eloise and Ramona drinking lemonade". I love the simplicity of the lines. It's so charming without being too twee. Christina, I'm a follower! And I'm twittered about it. Twitter name "ondressingup"
I just posted this on my blog! PS: I really like Emma reading Sinclair's mainstreet. so cute. I love the roaring twenties. 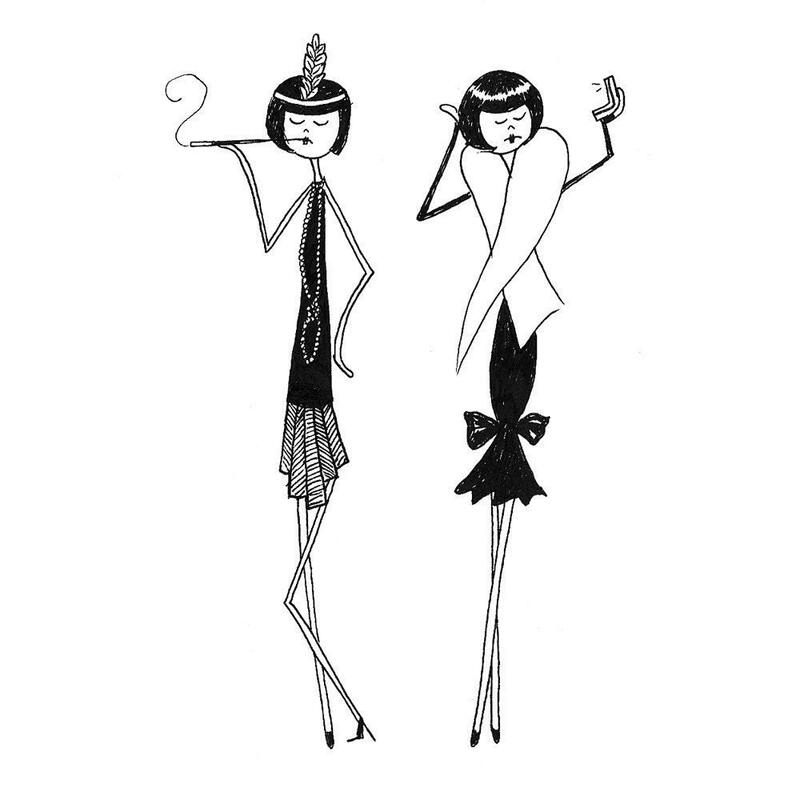 my friend just had a great gatsby costume b-day party and the invitations said "celebrate your roaring twenties in roaring style"
these flapperdoodles would have made great decorations/giveaways for best costumes!!!!! hmmm.....such a good idea i may buy some and do it for my next birthday before i turn 30. I hope I'm not too late to enter this b/c these are great! I love them all but the one w/ the cocktail dresses is my favorite!